Despite recent advances in research tendinopathy rehab remains somewhat in its infancy. Our management of this condition is very different now than 10 years ago and 10 years from now will likely see different treatments again. There appears to be a bountiful supply of theoretical research but little in terms of high quality clinical trials. By this I mean that we have established a host of theories on tendon pathology, function and rehab but we have surprisingly few high quality studies proving clinically significant improvement from treatment. Peter Malliaras et al reviewed the literature recently on loading programmes for achilles and patellar tendinopathy (2 of the most common) and found a number of methodological flaws. Just 2 studies were deemed ‘high quality’, only 2 described adequate blinding and the majority did not use a validated outcome measure. They also found that around 45% of patients didn’t improve significantly with exercise programmes. So, while we can make some recommendations, there is still some way to go before we have conclusive evidence on tendinopathy rehab. The development of a rehabilitation plan for an individual presenting with confirmed symptomatic tendinopathy requires complex clinical reasoning, with reference to the pathoanatomical diagnosis. Tendon pathology and subsequent rehabilitation will vary considerably depending on the site of pathology; stage of the tendinopathy; functional assessment; activity status of the person; contributing issues throughout the kinetic chain; comorbidities; and concurrent presentations. Tendon and muscle function together as a musculotendinous unit – we need to consider this in rehab, not just the tendon.. Each component of the rehabilitation programme, in particular loading, must be manipulated in relation to the nature, speed and magnitude of the forces applied to the muscle/tendon/bone unit in order to achieve the goals of the particular management phase without causing an exacerbation of the pathological state or pain. 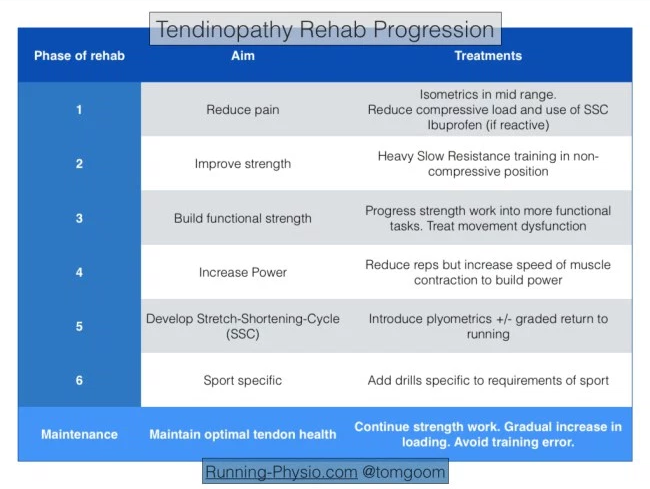 The first aim with managing tendinopathy is often to reduce pain. It is usually the most troubling complaint for a patient and pain in the tendon can lead to reduced activity in the muscle it’s attached to. Henriksen et al tested the effect of experimentally induced achilles tendon pain. They found that tendon pain causes “widespread and reduced motor responses with functional effects on the ground reaction force“. Avoid activities that place a compressive load on the tendon, usually this is any activity that would involve stretching the effected muscle or direct tendon compression. Cut out activities that involve the Stretch-Shortening-Cycle (SSC) which occurs when the tendon has to behave a like a spring, stretching then shortening to store and then release energy. Isometric exercises can help to reduce pain. These exercises should be done in a position where there is no tendon compression, usually in the mid-range of the muscle. They can be repeated several times a day, utilising 40-60 s holds, 4-5 times, to reduce pain and maintain some muscle capacity and tendon load. In highly irritable tendons, a bilateral exercise, shorter holding time and fewer repetitions per day may be indicated. Anti-inflammatory medications, such as ibuprofen can be used to help to reduce the reactive response. Once pain has settled you can progress to phase 2 and work on strength. Strength is the ability to produce force and in this context we are aiming to improve the muscle and tendon’s ability to produce force and manage load. Muscle and tendon respond to load but it is thought that repetitive loading, such as walking or running, is unlikely to stimulate significant adaptive changes. 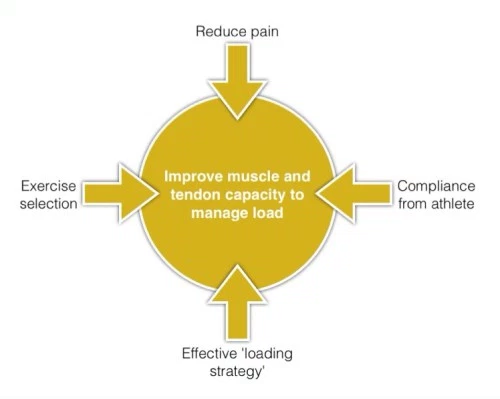 Instead heavy load is needed to promote changes in muscle and tendon that improve their load capacity. Strength is an essential building block for muscle function, without adequate strength muscle will have poor power and endurance. There are a number of options available to us in terms of exercise prescription, there is no recipe for this. It will depend on levels of pain and areas of weakness, patient goals and requirements of their sport. The question is how much strength is needed? In general we aim to achieve equal strength left and right and this can be measured using 10 rep max (10RM – maximum weight you can lift 10 times). For this phase of rehab you are aiming to achieve strength changes by exercising with sufficient load in a a muscle’s mid-range position. Avoid exercising with heavy loads in positions where there is likely to be tendon compression. Following research by Alfredson et al. eccentric exercises have been considered the gold standard for many years. More recently research has demonstrated the importance of also including the concentric phase of exercises with heavy slow resistance training. Heavy Slow Resistance training (HSR) has emerged more recently as another exercise option. Gaida and Cook discuss HSR and eccentric exercise briefly in their 2011 paper on patellar tendinopathy. They note there are pros and cons of each approach; eccentric work is often prescribed as a high frequency exercise – with Alfredson’s work recommending 3 x 15 reps of 2 exercises done twice per day. HSR by contrast is usually done 2-3 times per week but in many cases will require access to gym equipment. HSR involves using high loads – approx. 70-85% of 1RM (1RM – 1 repetition maximum – refers to the maximal weight you can lift once with good technique). Determining 1RM is difficult, especially in patients with pain so it can be approximated. 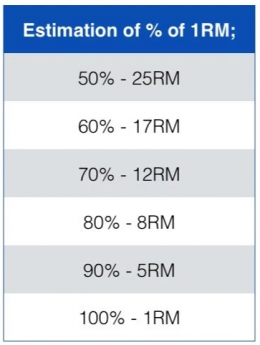 80% of 1RM is roughly equal to 8RM i.e. the maximal weight you can lift 8 times with good technique. Choosing load depends on the stage and severity of your condition and how confident you are with resistance training. Those with less pain that respond well to heavy loads may start closer 8RM. Others may need to build up more gradually. Ultimately though the goal is to reach these higher loads to create optimal tendon adaptation and muscle strength changes. The ACSM guidelines recommend working at between 8 and 12RM when starting strength work, although there is some debate on exact parameters and this is based on research on a health population not those with tendinopathy. They suggest 3 sets of 8-12 reps separated by 2-3 minute rest periods, repeated 2-3 times per week. Kongsgaard et al used a graduated approach starting with lower loads at 15RM and building up to 6RM over 9-12 weeks providing there was no significant increase in pain. They used the squat, leg press and ‘hack squat’ and recommended 4 sets of each exercise with a 2-3 minute rest between sets, repeating 3 times per week. A third option with strength work is the combined approach of Silbernagel et al. They used rehabilitation phases and progressed patients depending on their symptoms. They also encouraged a monitored return to sport. Silbernagel et al. don’t describe a specific amount of load in terms of % of 1RM, instead they start with the resistance of body weight (for calf raises) and progress in a similar manner to Alfredson – using a back pack or weights machine to increase load. There are however several key differences. Silbernagel et al. include both the concentric and eccentric component of the exercise and progress to include power and plyometric exercises. As such the findings from Silbernagel apply across most of the rehabilitation phases, not just strength. Malliaras et al reviewed the literature on achilles and patellar tendinopathy. They found that HSR training was more likely to lead to tendon adaptation but required further research. They didn’t find evidence to support isolating the eccentric component (as in Alfredson) although they did acknowledge that several potential mechanisms, such as neural adaptations, had not been investigated. Overall Malliaras et al found combined and eccentric as well as HSR loading had the highest level of evidence for improving neuromuscular function. 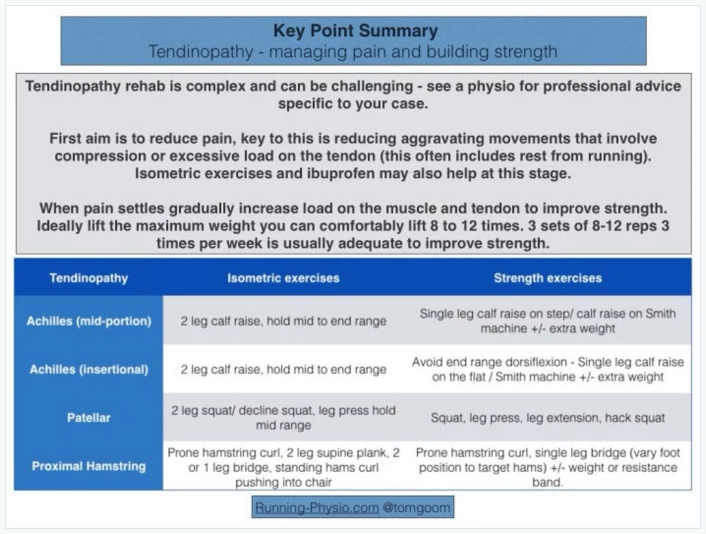 Phase 2 summary – tendinopathy is likely to result in reduced muscle strength and function. Restoring this is essential for the long term health of the tendon. Several strengthening options exist but all share a common goal – gradually increase the load on the muscle and tendon while carefully monitoring pain. Strength work should be done in mid-range positions to avoid tendon compression. Ideally for optimum strength changes the load should be sufficient that your patient can only manage around 8-12 reps (i.e. 8-12RM) you may need to build up for this as pain allows. For many reducing pain and building strength combined with a gradual return to usual activities will be enough to rehabilitate a tendinopathy. If this is combined with ongoing strength work to maintain tendon load capacity and a sensible training schedule then risk of recurrence will be fairly low. 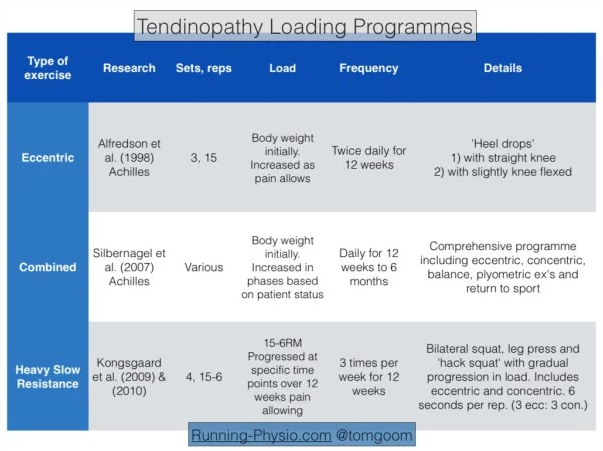 However for some with more severe or persistent tendinopathy or those whose sport requires a high level of loading then progression through the phases to including functional rehabilitation is recommended. Prior to starting functional rehab pain must be well managed and there must be adequate basic strength. As a rough guide 10 rep max should be equal left and right for the muscle involved. and addressing movement dysfunction that links to the tendinopathy. For this we must think more broadly in terms of muscle function and change position, reps, sets. This involves working out how the muscle is working and in what positions through the activity, then adapting exercises to be performed in these situations. Also think about the strength-endurance demands on the muscle and consider changing load and reps to match. By 'kinetic chain' we mean the rest of the body that's involved in a function. 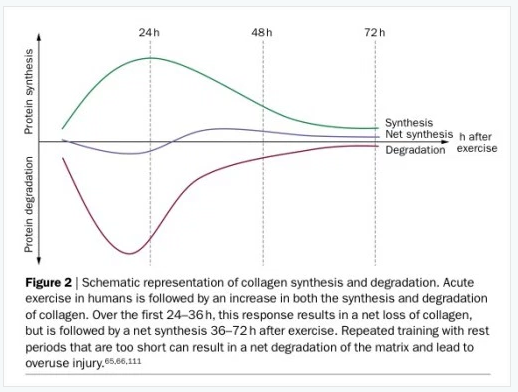 If we strengthen other muscles involved in this process we should, in theory, be able to reduce some of the load on the effected muscle and tendon. In doing so we can also improve economy and performance. For example in a trail runner with achilles tendinopathy we would also look at how the gluts and hamstrings are performing to optimise uphill running. Movement dysfunction is a complex. It covers a number of factors including strength, joint range of movement, tissue flexibility, movement control and biomechanics. There is a huge amount of variety in what is 'normal' and some debate about what aspects of movement we should change or even if we can actually change some of these aspects. 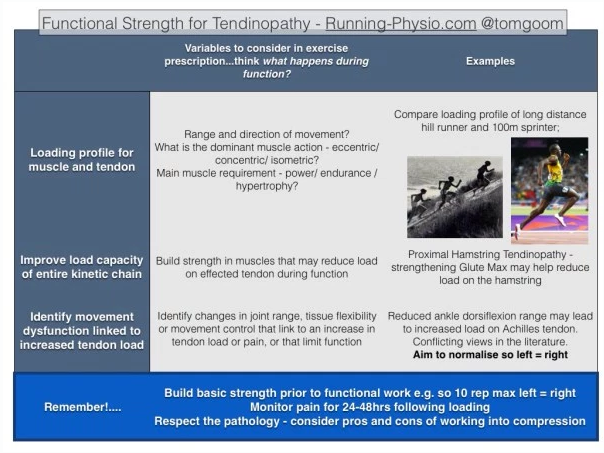 Load is such a key area in development of tendinopathy it is perhaps more likely that it is extrinsic factors such as training volume and intensity that are more relevant than intrinsic factors such as biomechanics. Like many aspects of patient care it comes down to assessing the individual and reasoning how each factor is linked and what is key. In terms of movement dysfunction look for differences between the symptomatic and asymptomatic side and see if they link with the pathology. Also aim to restore enough range and control of movement for function. If we really want to replicate function why not just do our usual sport? Silbernagel et al demonstrated that there are specific benefits associated with continuing sport as part of your rehab as long as pain is closely monitored. For example, running is likely to have benefits on cardiovascular fitness but is less likely to be as effective in building strength or improving tendon load capacity. In addition running activates the tendon's Stretch-Shortening-Cycle which requires adequate muscle strength to avoid excessive load on the tendon. The difference between functional rehab and just doing your sport comes down to the type of loading and how the muscle and tendon respond to it. A graded return to sport is a valuable part of tendon rehab but it isn't a replacement for appropriate strength work. Functional rehab can be a complex area and requires an individualised assessment of the individual. Exercises should be designed to improve the load capacity of the effected tendon and muscle during function as well as the rest of the kinetic chain. Identifying relevant movement dysfunction can be challenging but should involve assessment of joint range of movement, tissue flexibility, control of movement and biomechanics. These areas should be addressed while respecting the pathology involved and monitoring pain in response to loading. 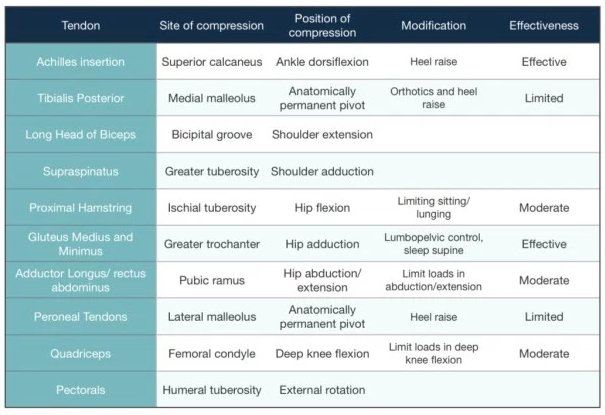 Exercises in positions with tendon compression should be use with caution. ↑ 1.0 1.1 1.2 Malliaras P, Barton CJ, Reeves ND, Langberg H. Achilles and patellar tendinopathy loading programmes : a systematic review comparing clinical outcomes and identifying potential mechanisms for effectiveness. Sports Med. 2013 Apr;43(4):267-86. ↑ Achilles Pain, Stiffness, and Muscle Power Deficits: Midportion Achilles Tendinopathy Revision 2018: Using the Evidence to Guide Physical Therapist Practice. Journal of Orthopaedic & Sports Physical Therapy 48:5, 425-426. ↑ Henriksen M, Aaboe J, Graven-Nielsen T, Bliddal H, Langberg H. Motor responses to experimental Achilles tendon pain. Br J Sports Med. 2011 Apr;45(5):393-8. ↑ Ebonie Rio, Dawson Kidgell, Craig Purdam, Jamie Gaida, G Lorimer Moseley, Alan J Pearce, Jill Cook. Isometric exercise induces analgesia and reduces inhibition in patellar tendinopathy. Br J Sports Med 2015;49:1277–1283. ↑ 12.0 12.1 Gaida JE1, Cook J. Treatment options for patellar tendinopathy: critical review. Curr Sports Med Rep. 2011 Sep-Oct;10(5):255-70. ↑ Nicholas A. Ratamess, Brent A. Alvar, Tammy K. Evetoch, Terry J. Housh, W. Ben Kibler, William J. Kraemer and N. Travis Triplett. Progression Models in Resistance Training for Healthy Adults. Med. Sci. Sports Exerc. 2002;34(2):364–80. ↑ Kongsgaard M, Qvortrup K, Larsen J, Aagaard P, Doessing S, Hansen P, Kjaer M, Magnusson SP. Fibril morphology and tendon mechanical properties in patellar tendinopathy: effects of heavy slow resistance training. Am J Sports Med. 2010 Apr;38(4):749-56. ↑ Kongsgaard M, Kovanen V, Aagaard P, Doessing S, Hansen P, Laursen AH, Kaldau NC, Kjaer M, Magnusson SP. Corticosteroid injections, eccentric decline squat training and heavy slow resistance training in patellar tendinopathy. Scand J Med Sci Sports. 2009 Dec;19(6):790-802.